Membership support is what keeps SDPB strong and its programs diverse. To become a member, renew your membership or give an additional gift, . That's easy! Select a contribution level that fits your budget. Friends of SDPB Memberships begin at the $40 annual level. 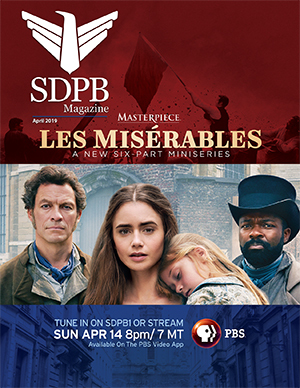 Friends of SDPB Members receive the monthly SDPB Magazine with TV listings and show descriptions, radio programs information, internet updates, news about the network and coming events and information about the Friends of SDPB. SDPB Magazine is available in a hard copy mailed to you or electronically through email. Simplify your life! Become an Evergreen Member! Evergreen Memberships are easier on Your Budget: Spreading your gift over each month can help you give at the level you wish, without having to make room in one single month's budget. Vital ongoing support: Your monthly support provides steady, reliable funding for the programs you love. More convenient: It's easy- your contribution can be made automatically from a bank account or credit/debit card, or you can mail a check each month. ! Decide how much you want to contribute to SDPB and how often- monthly, quarterly, or semi-annually. You can sign up to be an Evergreen Member for as little as $5 per month. Your membership is renewed automatically each year on your membership anniversary. For more information on the Evergreen Member Match click here . Your membership pledge is made using a secure transaction, and Friends of SDPB does not store credit card information. In addition, we do not share any information with other organizations.